The companionship and affection of a dog is one of the more popular benefits of our pet-friendly Springs Apartments communities. Sharing your apartment home with a pet involves some training at the outset, but the rewards are well worth it. We've put together some top expert tips to make the training process easier for you and your pet. Task #1 with any dog is teaching him appropriate bathroom habits. Without the luxury of your own back yard, this does present a bit of a challenge for apartment dwellers, but a little planning helps it go more smoothly. If you are unable to take your dog outdoors on a regular basis, potty pads make an effective alternative. They are available in both disposable and reusable styles. Designate a spot for the pads away from your dog's sleeping and eating areas. 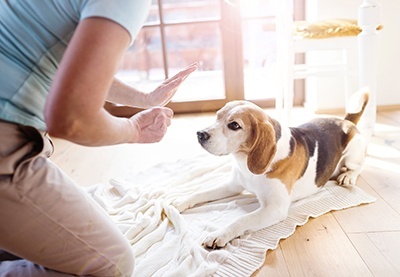 Take your pet over after eating and drinking, sleeping, playtime, or whenever he exhibits telltale clues such as circling and sniffing the floor. Use verbal cues encouraging him to eliminate and offer generous praise when he responds. If he has an accident, rubbing his nose in it is not a useful reaction. Simply take him back to the correct area, continuing with verbal reinforcement, and never resort to physical punishment. A crate provides a your pet with a comfortable place of his own while conditioning him to stay in one area. The living room is a good location where he can still be close to his "family." Make the crate appealing by placing a blanket or soft towel inside along with a pillow or cushion. Never use the crate as punishment, as this will condition him to fear it. Dogs generally avoid eliminating in the same place where they sleep, so a crate can be a useful refuge for your pet if you're away from home for several hours. Puppies have not yet developed control over their bladders, so if you have one it's a good idea to have a friend or neighbor check in. Depending on your dog's breed and personality, he might prove to be particularly vocal, especially when people or other pets pass by. Enlist the help of a friend or neighbor to teach your pet some restraint. Have the other person walk back and forth in front of your apartment several times. Choose a one- or two-word command for "quiet," and reward your dog with a treat each time he obeys. This positive reinforcement teaches your pet to become accustomed to outside traffic. Springs Apartments has pet stations located throughout the property so you have convenient access to supplies and waste containers to clean up after your pet. We love having dogs around, but we also want to keep the grounds as clean as possible for all residents. We enjoy hearing about our four-legged residents. Do you have a great "shaggy pet" story to share? Tell us about it in the comments!